Click/tap here to find the best Crested Butte, Colorado home inspector for your needs! ASHI Associate Member - American Society of Home Inspectors. ​My only goal is to do a great job for you. I have an insurance inspecton company and am in need of inspector to do occasional work in area. Prefer to add our requests to present routing. Please respond to jobop on our website if interested. 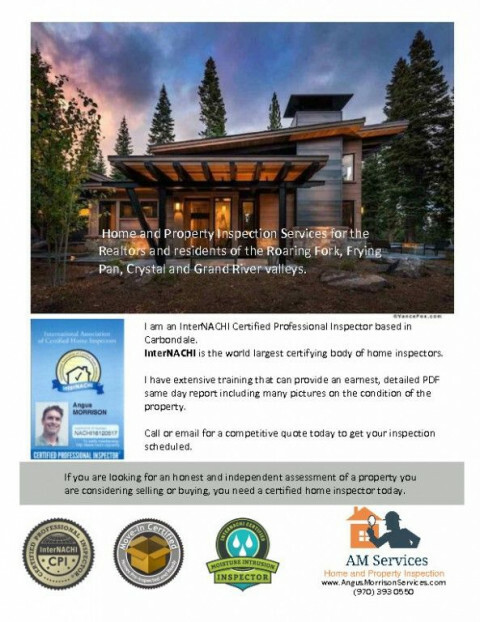 If you are looking for an honest and independent assessment of a property you are considering selling or buying, you need a certified home inspector today. I am an InterNACHI Certified Professional Inspector based in Carbondale, Colorado 81623. I have extensive training that can provide an earnest, detailed PDF same day report including many pictures on the condition of the property. Serving Eagle and Summit Counties. I have completed many different types of inspections over the years which has given me a very well rounded view of a home inspection. I have been a resident here for many years now. I understand the homes here – how they work, what issues affect them the most, how those issues are fixed, and I know the best ways to find those issues. In addition to my inspection experience I have worked in many different aspects of the trades. My experience has really helped me to understand buildings and to bring the best value possible to my clients. I have called the Colorado Western Slope home for more than 40 years. My wife and I have been married for 14 years and we have 5 young beautiful children. It was an honor to work for and learn from my dad for many years. He has a solid reputation as a trusted and excellent custom home builder. As he moved into retirement, I transitioned to inspecting homes full time. I really enjoy helping people understand how their home works and the condition of the homes they want to buy and sell. As a trained and Certified Professional Inspector, and with 18 years of experience in the building industry, I have gained the knowledge and the experience to spot problems with materials, installation, and workmanship.